Can You Solve THE RUNES? "The Myriad Mysteries of THE RUNES"
including the fun, challenge and the ancient secret to uncover. ” I thought it should take me until summer break is over. “This should come with a warning label on it. ...It's highly additive. You have a great adventure before you. It is weird at first trying to solve puzzles without a clue as to what they are about. But it all slowly falls into place, and you will have wonderful "Eureka" moments of discovery when you realise what is going on and what type of puzzle they actually are. Can You Solve The World's Greatest Puzzle? 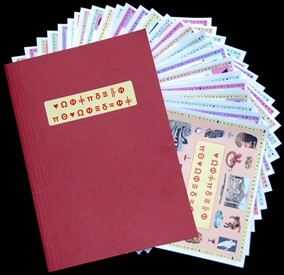 The Runes is presented in colour on 27 A4 pages (11" x 8"), inside a presentation folder. 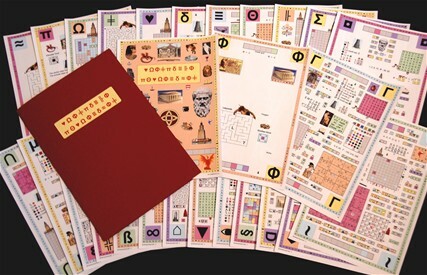 There is little text, just a very large number (300+) of original puzzles and a challenge to unravel the underlying ancient mystery. This includes free access to THE RUNES FORUM, where you can check some of your solutions; record and compare your progress with other solvers and exchange hints and help. For post and packing to UK addresses, please add £2. You can pay by credit or debit card, PayPal, cheque, or money order. For posting overseas, We always ship airmail, which means that you are most likely to receive the puzzle within about 5 working days of paying for it. The price for THE RUNES sent in this way is as follows: Europe: £39.95; USA: $69.00; Elsewhere: £43.95. You can pay by card or by PayPal. You order THE RUNES simply by letting us know that you would like a copy. We will confirm your order and then you can decide which method of payment suits you best. The payment will be handled with full PayPal security and you will be able to use a credit or debit card, PayPal account or cheque.